E dwina is a veterinarian from Sydney who’s had an interest in all things animal-related from a very early age. Throughout high school she worked at the local vet clinic and had a unique array of pets at home, ranging from dogs to hermit crabs. Edwina completed a Bachelor of Animal and Veterinary Bioscience at the University of Sydney. Her interest in livestock welfare prompted her to complete an honours research project with piglets investigating acute pain responses from different identification methods. She continued to nourish her growing fascination with animal health and epidemiology in her PhD. During her candidature at the University of Sydney, she navigated through the remote regions of eastern Indonesia investigating pig trade and disease spread. Her thesis was on pig movements across Nusa Tenggara Timur province and the associated risk of classical swine fever transmission. 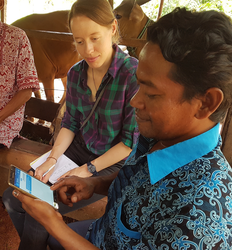 This project involved market and village surveys across Timor, Flores and Sumba islands with smallholder pig farmers and pig traders. It gave her the opportunity to live in Indonesia and see first-hand the benefits of applied epidemiology and agricultural development. Edwina then returned to university to complete a veterinary science degree (University of Sydney). She continued to publish papers and participate in research projects throughout the degree. She also completed a final year veterinary rotation working at a clinic in Laos while also contributing to some local animal health projects. Since joining Ausvet at the beginning of 2017, she has worked on a variety of projects including: disease surveillance in terrestrial and aquatic animals, improving smallholder cattle production in Indonesia and livestock welfare. This job allows her to fulfil her interests in veterinary science, research and international development. Outside of work, Edwina enjoys the outdoors whether it be hiking, scuba diving, kayaking or taking her dog, Dougal to the park.